karen Keskulla Uhlenbeck, a University of Texas at Austin emeritus professor renowned for her groundbreaking advancements in geometric analysis and gauge theory, is the first woman to win mathematics’ prestigious Abel Prize. Modeled on the Nobel Prizes and given out by the Norwegian Academy of Science and Letters, the Abel Prize is awarded annually to mathematicians whose contributions to the field are of “extraordinary depth and influence.” The prize carries a cash award of six million Norwegian kroner, or roughly $700,000. 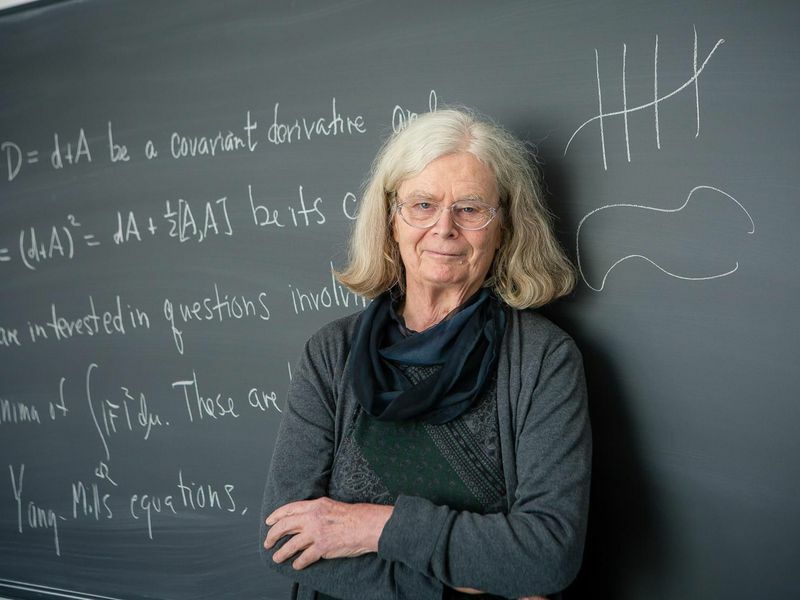 As Kenneth Chang reports for The New York Times, Uhlenbeck, honored for “the fundamental impact of her work on analysis, geometry and mathematical physics,” is the first female awardee in the Abel’s 16-year history. Since the prize’s inception in 2003, 20 awards have been distributed, including six mathematicians who were recognized jointly. One of Uhlenbeck’s most significant discoveries revolves around a seemingly mundane subject: soap bubbles. In higher-dimensional curved spaces, Davide Castelvecchi writes for Nature News, these glistening orbs act as key examples of “minimal surfaces,” forcing themselves into shapes that minimize energy by taking up the least amount of area possible. Breaking down this complex theory in layman’s terms, mathematician Arne B. Sletsjøe explains that the fixed volume of air inside of a bubble makes the soap film minimize surface tension by pulling it into the shape of the least surface enclosing a fixed volume—in other words, he explains in an Abel Prize statement, a perfect sphere. Jonas Cho Walsgard of Bloomberg further notes that the newly minted Abel winner has helped theoretical physicists better model concepts from particle physics string theory and general relativity. Her work with gauge theory, popularly deemed the “mathematical language” of the field, “underpin[s] most subsequent work in this area,” Imperial College London’s Simon Donaldson wrote in a survey of Uhlenbeck’s legacy published earlier this month. Uhlenbeck is the first female honoree in the Abel Prize’s 16-year history. Growing up, Uhlenbeck never envisioned herself as a mathematician. Instead, she explained in a 1996 autobiographical essay, the young Karen Keskulla was more interested in reading hefty scientific tomes. After enrolling in a freshman honors math course at the University of Michigan, however, she changed her tune, and in 1968, earned a PhD in mathematics from Brandeis University. As one of the few women in her program, Uhlenbeck experienced considerable pushback from male peers and professors. Following several largely disheartening stints at universities across the country—Quanta’s Klarreich points out that Uhlenbeck’s then-husband, biophysicist Olke C. Uhlenbeck, was employed by the same institutions, often leaving her in the position of underestimated “faculty wife”—Uhlenbeck eventually ended up at the University of Texas at Austin, where she remained until her retirement in 2014. Winning the Abel Prize adds yet another chapter to Uhlenbeck’s long history of shattering the glass ceiling: As The New York Times’ Chang notes, she previously won a MacArthur Fellowship and, in 1990, became only the second woman to give a highlighted plenary talk at the quadrennial International Congress of Mathematicians. According to a UT Austin press release, Uhlenbeck has also spearheaded several outreach and mentoring campaigns aimed at supporting women in mathematics. Previous articleSpring arrives. What really is an equinox?